Unfortunately I'm in a rotten mood and don't really want to go to any stinkin' party. Bah! Humbug! But I spent 18 bucks on materials for my costume and I'm not going to let that go to waste. Lyrics by Richard Gebel. Sung with gusto (and beer, for those who like the stuff) to the tune of "Supercalifragilisticexpialidocious." While Erfurt was a challenge, it was just to please my Pa.
Then came the storm, the lightning struck, I called upon Saint Anne, I shaved my head, I took my vows, an Augustinian! Speak your mind against them and face excommunication! 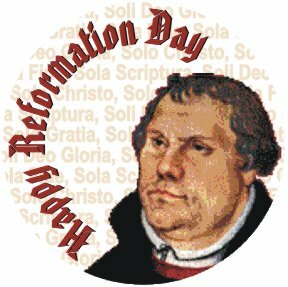 Nail your theses to the door, let's start a Reformation! Papal bulls, indulgences, and transubstantiation! "You cannot purchase merits, for we're justified by grace! The Pope, however, hauled me up before the Emperor. By knighting "George" as hostage in the Kingdom of the Birds. Lucy Zoe commented Wednesday about the "Brussels Sprouts Syndrome" and her determination to try again to read Austen. For anyone in that position, I'd highly recommend watching some of the better Austen-based films as a means of working your way up to the novels. The BBC/A&E production of Pride and Prejudice is the best of the best. Emma Thompson's Sense and Sensibility, Gwynneth Paltrow's Emma, this 1970s BBC Emma, and Amanda Root's Persuasion are also good, if not perfect. Avoid this Mansfield Park like the plague. It is the worst adaptation I've ever walked out of after only 15 minutes. The 1940 P&P with Greer Garson is also too flawed to be worth consumption. One of my favorite pet peeves is the lousy service one gets these days at fast food joints, retail stores, etc. Some of these young punks they employ have all the personality of a vending machine. From the monotone "would you like to try a combo meal" to the smileless, eyecontactless exchange of funds and food, they are nonpersons and treat their customers as nonpersons. Well, it occurred to me that it was completely idiotic to expect anything else of them -- they're just acting the way the soulless world has taught them to act -- but that I ought to expect a whole lot more of myself. So I really went for it last night, saying please and thank you and even yes sir in the most charming tone I could muster to the disembodied voice emanating from the speaker in the menu board. And when I got to the window I was rewarded with a big grin, a polite request for my sauce preference for my nuggets and even a yes ma'am to my response. I think I'll try that every time! *OK, so this story actually took place at Wendy's, but I've got a valid poetic license, so there! Well, There's the Solution, Then! "I believe in the vows I took with my wife," said Michael Schiavo. "I want to spend the rest of my live with her and I'm going to do that" (quote lifted from Zoe). So we say, "Sure, Mike! We'll stop giving Terri food and water...and you too so you can fulfill your hearts desire of spending the rest of your life with her." If only the command to look after widows and orphans could be understood typographically, I'd be some kinda super-holy saint, lemme tellya! Now I have four USB devices and two USB ports (is that the right word?). Three and two wasn't so bad as the third device is my camera and I can cope with downloading some photos without my Wacom tablet. But working with a scanner and a mouse is too ouchy for my wrist. Is it possible to install more USB ports? Is it something a layman can do? On a related note, I have an appointment November 3 to get evaluated for carpal tunnel syndrome. Considering I've been having wrist problems for about five years now, I figure it's about time. I think I've drunk more tea in the last couple weeks than in my entire life previously. I've finally figured out how I like it -- fruity herbal teas with a goodly splash of lemon juice and a very generous dose of honey. We'll see if I continue my addiction once I'm over my cold and no longer need to drink the brew medicinally. Sometimes Being Hard-Hearted Is a Good Thing! Any suggestions? I need it for photos for Web and print. 10/15 -- Thanks for the input so far! How 'bout one of these? The Ivy Clan, including Dima (center, yellow T-shirt), newly arrived from Russia after his October 2 adoption! Woo-hoooooooo!!!!! All the Interviews Are Done! Roy J -- Great great-grandparent stories! Paul B -- I give him an interview and he gives me a scolding. Sheesh! Bill C -- Can't remember another conversion story quite like Bill's! Toni C -- Only 28 pairs of earrings? Amateur! Jessie -- Too many cheater answers! John B2 -- Another great story...this time conversion + calling! Ellen H -- Leather pants?!?! God Is So Very Good! Grab a hanky and read this. Alas, I did not bring a camera on this trip, but Carmon had one and perhaps will have pics posted when she returns to California. Carmon and her son Pieter and daughter Rebekkah are on a whirlwind Eastern U.S. tour to visit family and friends. Since they'd planned a visit to St. Peter, I decided that was close enough for me to travel to meet them. The Friedrichs stayed with the Saenzes, while I enjoyed Sproulian hospitality. Not once getting lost, breaking down or losing my cool -- a very noteworthy road trip non-event for me! I had an upset stomach most of last week. This weekend I was fine throughout my entire trip to Virginia/Tennessee and back (musta been all that good food -- physical and spiritual). As soon as I walked back into my office, my tummy was in knots again. Hmm...couldn't be stress, could it? I've prepared interviews for seven people (three two of whom have not yet answered their questions -- hint, hint!). If anybody else wants an interview, just pick five questions from the ones I've asked them. I can't come up with any more! 1) Have you ever had a recurring dream or recurring themes in your dreams? If so, describe them. If not, just tell us about a couple of the most interesting dreams you can remember. 2) What would be your dream job for when you come back to the States next year and what would be your dream career if education, talent, aptitude, etc. were no obstacle? 3) What would your dream guy be like and would you give up your dream job and/or career if you married him? 4) You've been lots of places, but of the lots more places to go where would you take your dream vacation? 5) What do you dream your life will be like in 10 years? An online friend mentioned last week that she'd decided to start wearing a hat to church. I've said for a long time that if someone with legitimate authority asked me to wear a headcovering, I'd do so gladly. Well, as the conversation progressed, I realized there really wasn't any reason not to do it now. I've been wanting to do this for a while, so I've sort of had it all planned out in advance for the time I finally made the decision. I've ordered three of these, which I think will work better for me than hats, since I can never find hats that fit my fat head and don't look perfectly ridiculous on me. I have a pattern if I want to crochet more in other colors, and I have a pretty good collection of scarves and bandanas for variety. Ooh! Ooh! He's Back, Too! Ceci n�est pas une blog. The ontobloggers' server has returned. Welcome back, y'all! I just got through facilitating a meeting at work with a room full of mostly directors and VPs. We were making the 2004 master plan for the newsletter I edit. I was really mean to them -- made them stay on topic and stay concrete rather than drifting off into the ether as they are wont to do. And they left saying, "This is the best meeting we've ever had!"